The Downhill Course at Clemson located in Issaqueena is CLOSED until further notice. This means no entry from anyone not authorized to be there. Please, no riding "just to see what's out there," no walking the course. Do not cross the signs and tape. The course is under construction and it is very dangerous to be on the course right now. Not only are we still working on the features, when we test ride the jumps we are not expecting anyone to be on the course and a crash could happen. This is for your own safety. If you would like to help please send me (Patrick Smith) a message on facebook and I'll let you know when the next work party is. Please spread the word to anyone you know who might be interested in the course. There will be a big announcement when it is reopened but until then please do not enter the course. Posted in News on January 17, 2015 by Kel. Happy holidays from Upstate SORBA! Now that December's craziness is slowing down, here's some information from your favorite local mountain biking association. We had us some elections and swapped a bunch of information, so read on. Remember that we have until January 5 to comment on the revisions to the management plan for Pisgah. Potential changes include deeming 700,000 acres suitable for logging, and closing some trails to mountain biking. Details & links are below. Make your voice heard! One last thing: Upstate SORBA is a registered 501(c)3 nonprofit, so if you want to make those final tax-deductible donations before the end of the year, choose US (ha, get it? Upstate SORBA, US... you know). We are 100% volunteer-operated, so all donations go toward our work supporting Upstate trails. Thank you for all the support this year! Happy trails and happy new year! Outgoing President Jarret Peek offers thanks to this clubs members and volunteers for growing the mountain biking community in the Upstate. Happy holidays, enjoy your rides/weekends, and he'll see you out there on the trails! Friends of DuPont Forest have a new and improved map for use on iOS or Android. Download the free Avenza app, and then search for "fodf" in the Map Store; for $4.99 the PDF map of DuPont is yours. All proceeds help FODF continue to fund trail and educational projects within DuPont State Recreational Forest. Remember that you can still offer public comment on the revisions to the management plan for Pisgah & Nantahala National Forests. There will be another email coming out soon with more information, but you can read more on IMBA's position here, and USFS documents about it here. Responses are due to the USFS by January 6! It's hunting season. Don't become a hunter's target: wear bright colors, use bells, and stay aware! Greenville MTB, run by Kel Shipman, hosted a youth clinic on 12/20 led by substitute teachers Sean & Daniel O'Connor. There were 15 participants at Gateway Park, and it was a great event! Thanks to all who helped to organize & run it, as well as participants. The Trenor Family has donated money to install a bike work station at Pleasant Ridge. Thank you to these stellar local riders! Reiterating here that this year we'd like to hold some meetings in different locations, e.g. near Clemson, Oconee. If you have suggestions for venues, please let us know! Our club is chartered to serve an 8-county area; we'll be working this year on building up membership in non-Greenville areas. See below for riding groups in our region, and don't hesitate to join up. 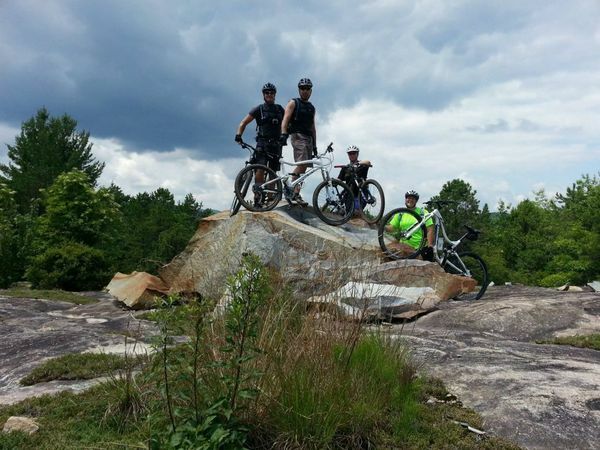 Lake Conestee Nature Park: As you've probably seen in the news lately, Greenville MTB and Upstate SORBA donated $500 to Lake Conestee Nature Park, on behalf of the mountain biking community and the park's trail users. Thank you! FOPM has raised >$700K from the Land Trust Bank, and need to make a total of $1.2M to make the purchase. Estimated purchase by summer 2015; trails will then be open to the public. Until then, riding is by owner permission ONLY. Hunting is also allowed there; wear bright colors! Use bells! Diverse groups are willing to invest, & it behooves us to convince the state park system that it's worth it. We encourage you to email State Park Director Phil Gaines at pgaines@scprt.com. General message: the existing trails within the park are so overstressed by concentrated use that trail work can't do much to revive them. What will help is offering more room to roam, so that riders (and impact to trails) will be spread across a wider area, and be less concentrated. Upstate SORBA strongly supports the potential expansion of PMSP. Pleasant Ridge: The IMBA Level 1 Certification course at Pleasant Ridge went very well; thanks to Marty for organizing the program, and thanks to instructor Rae Gandolf for traveling here to certify the five new instructors in our area. As mentioned before, new trails are under development, with local trail builder Shrimper Khare going into "Shrimper Mode." There's a lot of tape out there.... The trail will be made paved-surface between mile markers 1.5 and 1.7, with volunteer work days on a natural-surface reroute beginning in February. There will also be some more downhill-style trails in the not-too-distant future. Issaqueena: FYI the Issaqueena downhill course is closed right now. Might reopen by mid-January, might be racing by mid-February. If you ride the trails at Issaqueena, get in touch with the local club (listed below) to support their trail work days. If you ride it, dig it. 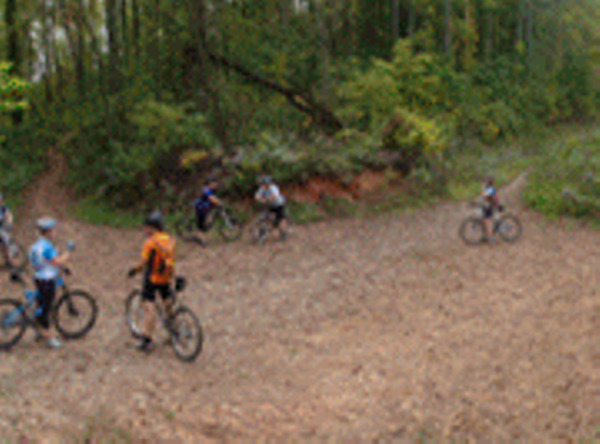 Sat Jan 3, 9am-2pm @ Paris Mountain SP: Big Dig Day 2015 Kickoff. Start your year off right with cardio and volunteerism, all at once. Meet at PMSP's upper parking lot. Help PMSP recover from Cranksgiving, and work off your hangover in a glorious fashion. Looking to make this a big turnout, so come on up! Mon Jan 5, 6-8pm @ Compadre's Mex-Mex Grill: Board Meeting. The usual, except with a little more strategic planning at our first meeting of the year. The meetings are open; if you're interested, come on down! Mon Jan 5 - Final deadline to submit comments to USFS re: revisions to land management plan for Pisgah & Nantahala National Forests. See links above. Sat Jan 10 @ Dupont State Forest - Friends of Dupont Trail Work Day. Dig what you ride! Contact Molly Burgmann for more information (llbmwb@gmail.com). Sat Jan 10, 2015 @ U.S. National Whitewater Center: Rumble in the Concrete Jungle. A crazy ol' race where riders rampage through the drained concrete channels of the U.S. National Whitewater Center! Details at the USNWC website. Mon Jan 19, 2015 @ TBD: General Membership Meeting/Social. Get to know your fellow mountain bikers, eat tasty noms, and get the latest scoop from the club. Details will be emailed & posted to Facebook. These are always on the third Monday of the month, so you can pen it into your calendar. Sat Jan 24, 2015 @ Fontana Village, NC: Icycle. The original -- a big ol' crazy festival weekend with day and night XC races at Tsali! Put on by the inimitable team at Pisgah Productions, who contribute their time and support to our own Cranksgiving. Board members who've been to Icycle in the past HIGHLY recommend making the trip up there! More information here, and registration here. Sun Jan 25, 2015 @ Charlotte, NC: Winter Short Track Series #1. It's MTB, park, BMX, and crit riding all rolled into one; lots of fun and very spectator-friendly! Details here. February, TBD: Lover Cat, a new alley cat event. Get in touch with Darby Wilcox (darbywilcoxbooking@gmail.com) if you're interested in helping. 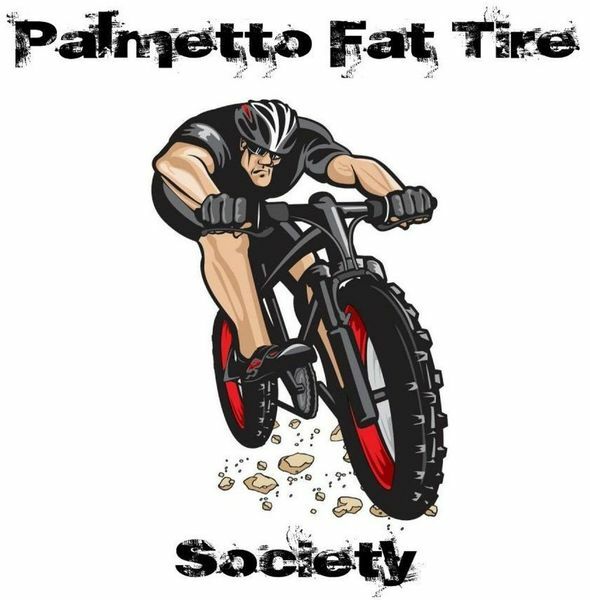 Spartanburg Area Mountain Bike Association (SAMBA) is starting to get rolling again: stay tuned for meetings and developments on their Facebook page. Greater Clemson Mountain Bike Club: on Facebook. Dig what you ride: get in touch with them for trail work days. Get in touch with Jarret via FB if you want more direct contact information. Clemson Recyclery is doing some great stuff, like keeping bikes out of dumpsters and giving them back to community members. Check out their Facebook page. Posted in Meeting Minutes on January 14, 2015 by Kel.